INTEL’S NEW REALITY: Fashion followers who prefer to catch the shows from their bedrooms, will get a more authentic view this season thanks to an alliance between Intel and IMG, WWD have reported. 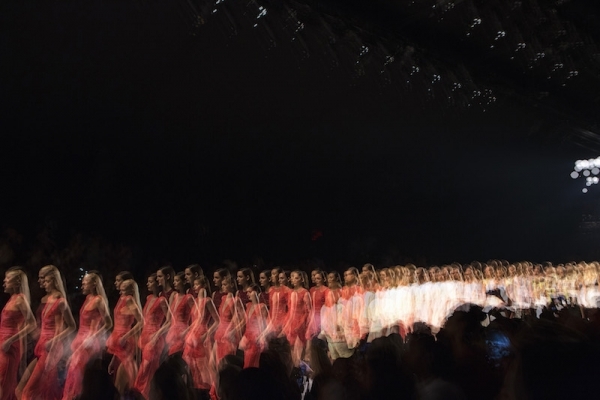 As the official technology partner for the New York Fashion Week spring shows, Intel has lined up a roster of designers including Prabal Gurung, Marissa Webb, Erin Fetherston and Dan Liu to live broadcast their respective shows using stereoscopic virtual reality. By downloading Voke’s GearVR app to use with a Samsung Gear VR headset, fans can get a sharper view of what’s going on the runway. They can also check out the NYFW site or the participating designers’ sites for a 2-D look at the shows. Other New York Fashion Week participants on board with the program include Band of Outsiders, Noon by Noor, Lisa N. Hoang, Namilia, Irina Vitjaz, Supima, Misha Collection and Telfar. In recent seasons, Intel has made its presence known during the New York runway shows, teaming with select designers like Chromat last season to create dresses and sportswear that used sensors to glow in the dark. Intel chief executive officer Brian Krzanich won’t be at any shows this time as he has in the past. For this month’s round of shows, Intel has collaborated with Tome, which will show a bracelet based on Intel Curie technology that is designed to help wearers improve their health and stay connected on-the-go. Intel and Tome’s designers Ryan Lobo and Ramon Martin have also joined forces to create a concept handbag that will be equipped with Intel technology that will measure ambient temperature, toxic gases and barometric pressure. Baja East x Fila will also use Intel’s Curie technology for Fila footwear designed to track the wearer’s fitness level. Ticketless consumers can get a glimpse of Intel’s wearable and concepts at The Shop at NYFW where Tag Heuer connected watches will be up for sale. This entry was posted in Latest News, NYFW and tagged Dan Liu, Erin Fetherston, intel, Marissa Webb, noon by noor, nyfw, Prabal Gurung, SS17, Tome, wwd. Bookmark the permalink.